The Pan-American Exposition was originally scheduled for 1897 on Cayuga Island, New York, a few miles upstream from Niagara Falls. 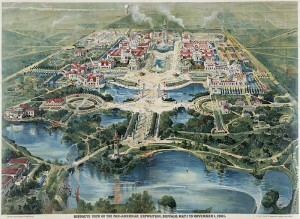 But the Spanish-American War intervened, and fair was eventually held in May-November 1901 in Buffalo, then the eighth-largest city in the United States. Today, the Exposition is chiefly remembered as the site of President William McKinley’s assassination on 6 September 1901. But before that momentous event, one of the biggest novelties was electricity: the fair was lit by Nicola Tesla’s new three-phase alternating current, powered by Niagara Falls, twenty-five miles away. 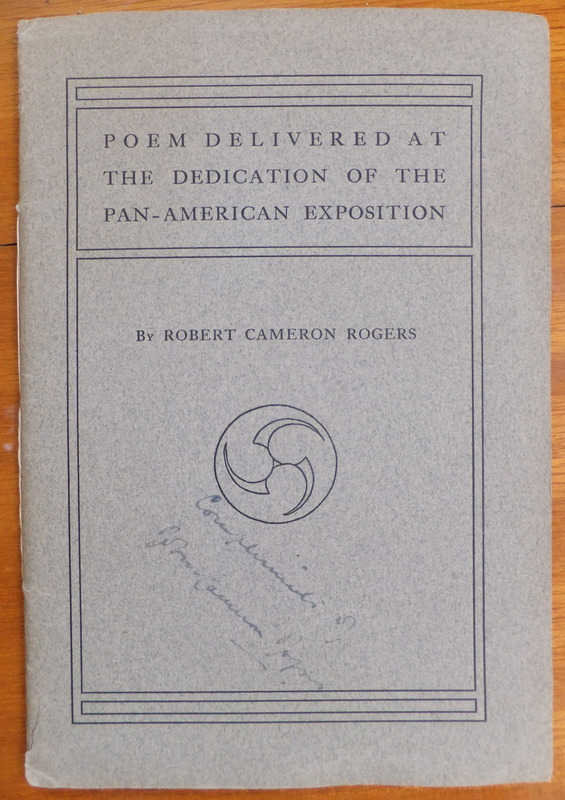 Robert Cameron Rogers (7 Jan 1862-20 Apr 1912) was born in Buffalo, and graduated from Yale in 1883. His father, Sherman Skinner Rogers, was one of the most prominent lawyers in Buffalo, and Robert spent a year in his father’s firm before deciding that law was not for him. 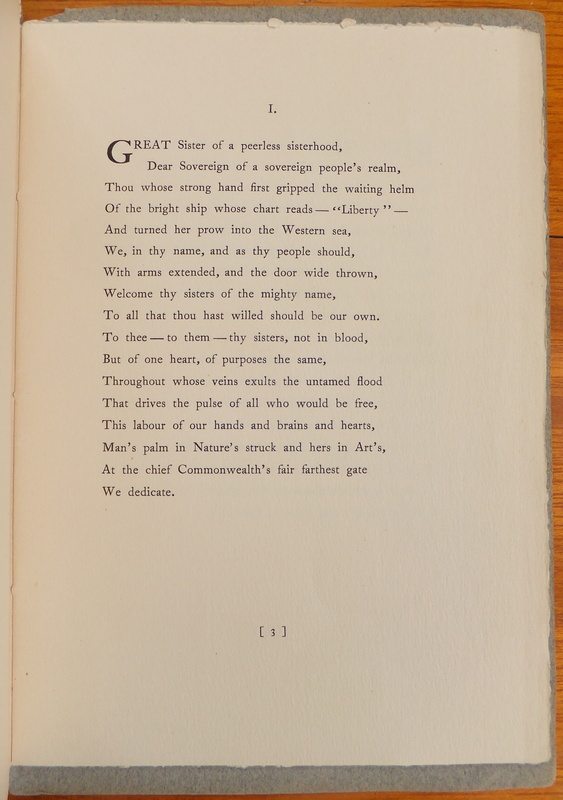 Instead, he turned to writing, and published books, poems and magazine articles. 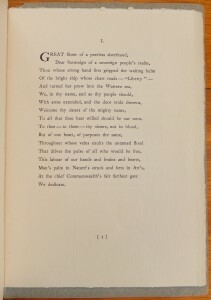 His 1898 poem “The Rosary” was set to music several times, most notably by Ethelbert Nevin, and sold very well as sheet music. 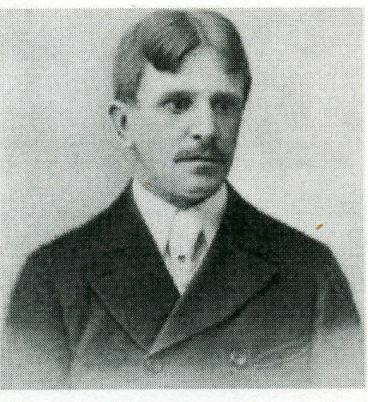 Rogers moved to Santa Barbara in 1898. In 1901 he purchased The Morning Press newspaper, which he molded into one of the most influential and best-edited papers in California. 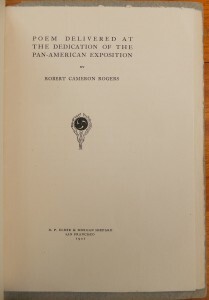 At first glance, it is perhaps surprising the small San Francisco firm of Elder & Shepard should publish this volume, especially since New York City, the undisputed center of American publishing, was so close to the Exposition. This was probably due to Morgan Shepard’s Santa Barbara connections, perhaps his sister-in-law Katherine Putnam, author of Wayfarers in Italy. 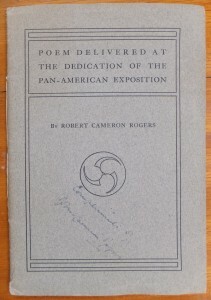 The cover and title page feature a tomoye design, though the tomoye has no connection with the poem or the Exposition. The tomoye had only recently been chosen as a sort of “logo” by Elder & Shepard, and they were clearly trying hard to establish their brand. 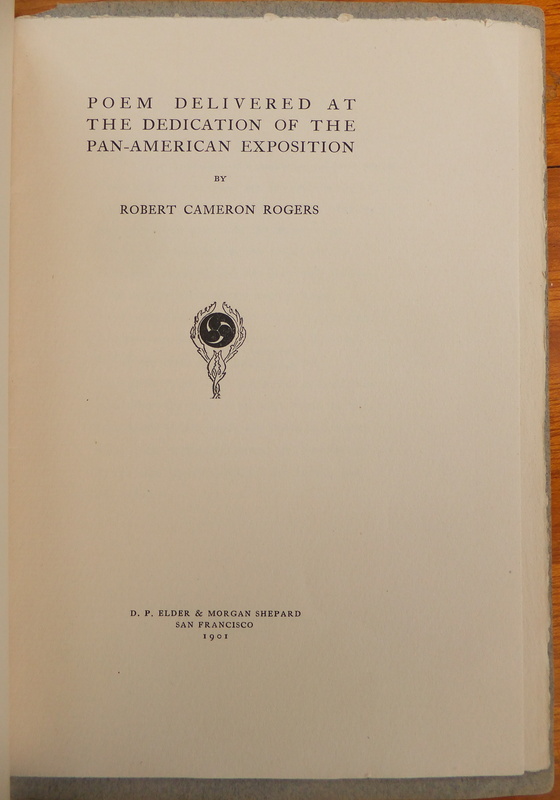 Rogers died in Santa Barbara in 1912 from complications of an appendicitis operation. Previous post: Updated bookstore pages!